An estimated 1,500 people demonstrate in front of the Constitutional Court in late August. On the heels of two months of lobbying in Washington D.C. and Ottawa seeking government intervention on its behalf, Tahoe Resources announced on September 10th that the Guatemalan Supreme Court of Justice had reinstated the operating licence for its Escobal project in southeastern Guatemala. Questions remain over this court decision, which is now under appeal, and a final ruling from the Constitutional Court could be months away. However, regardless of the court’s verdict, the Escobal project clearly lacks a social licence to operate. Operations have been stalled since June 7th when residents from six municipalities in the area of Tahoe’s silver mine initiated a check-point in the municipality of Casillas to prevent mine-related traffic from reaching the project. Contrary to the company’s representation of this action as an “illegal road blockade”, the community-led demonstration is taking place roadside, on private property. This protest, which is a reflection of six years of community organizing, continues today. 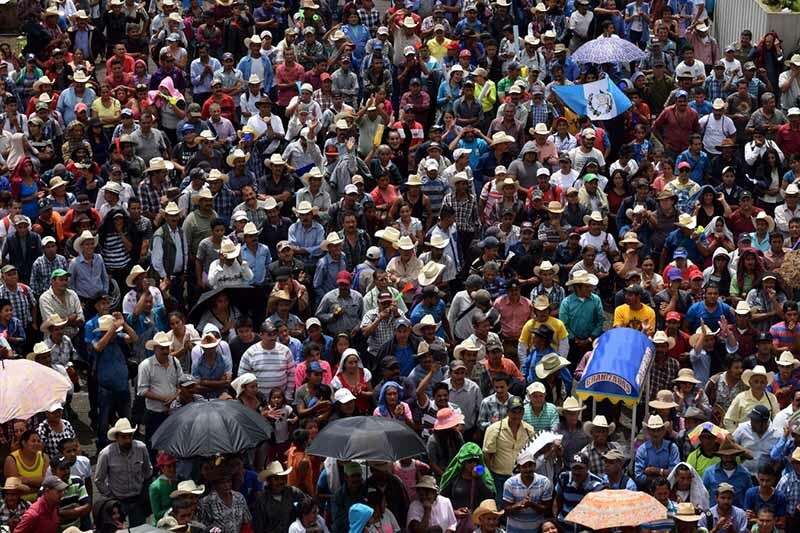 Over the last two months, dozens of international organizations have criticized the company’s inaccurate characterization of the protest and the smear campaign launched by the company's associates in Guatemala. They point out that these misrepresentations and threats put community members at serious risk of further repression and criminalization. Since June, police have already tried to violently evict the protest twice. Tahoe CEO Ron Clayton is also wrong when he states in a recent press release that community opposition comes from “non-locals”. Lack of social licence has dogged Tahoe Resources since the beginning of its project. Since 2011, tens of thousands of residents in eight municipalities around the Escobal mine have voted in municipal plebiscites demonstrating their opposition to the project, or any mining in the area, out of concern for their water supplies, health, and local agriculture. Five municipalities refuse to receive any royalty payments from Tahoe’s mine operations and are now parties to the legal proceedings over discrimination of the Xinka Indigenous population and the Ministry of Energy and Mines’ failure to consult with them. In this latter regard, on July 5th, the Supreme Court of Justice (SCJ) temporarily suspended work at the Escobal mine due to discrimination and the lack of prior consultation of Indigenous Xinka communities, whose ancestral territory is affected by the project. The country’s Constitutional Court confirmed the suspension in late August in response to an appeal filed by the company’s Guatemalan subsidiary. On September 10th, the SCJ issued a second ruling that upheld the original decision stating that Xinka Indigenous people were not properly consulted regarding the Escobal mine. The sentence reiterates the order that the Ministry of Energy and Mines must carry out a consultation process according to the International Labour Organization’s Convention 169 within one year in order to “restore the constitutional rights of the Xinka Indigenous community in the departments of Santa Rosa and Jalapa, which have been violated.” As such, the court’s decision recognizes that Tahoe’s operations do not just affect people living within the municipality of San Rafael Las Flores, but also surrounding municipalities in two departments that are experiencing or could experience negative social and environmental consequences. The SCJ decision did not address, however, the central issue of discrimination against the Xinka, which is part of the appeal filed before the Constitutional Court by the Guatemalan Centre for Legal, Environmental and Social Action (CALAS). CALAS is also appealing the SCJ’s decision to lift the suspension on the company’s licences. The Xinka Parliament and the Western Mayan Peoples Council (CPO) are also expected to file appeals. A decision is likely months away. “Discrimination and lack of respect for the self-determination of Indigenous peoples is one of the problems at the centre of the Indigenous movement’s struggle in Guatemala, there was no way that we could stand by while a mining company, in collusion with the Guatemalan state, has been denying the existence of an Indigenous people. This is an important case with national repercussions,” remarked Francisco Rocael Mateo of the Western Mayan Peoples Council.